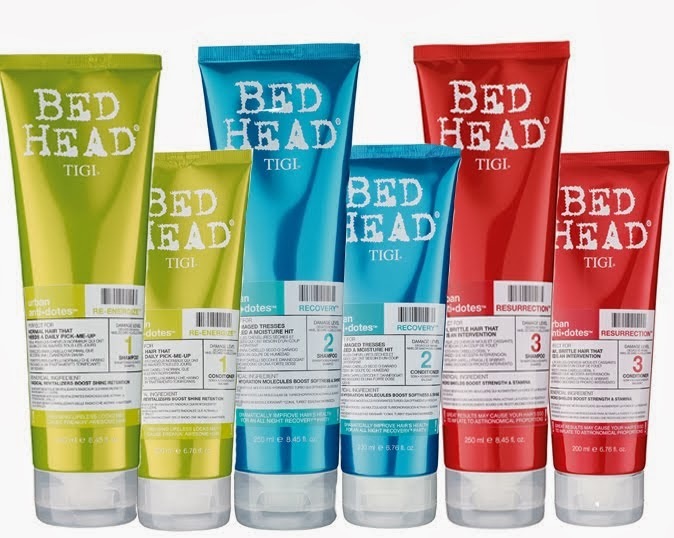 Beauty Blog by Angela Woodward: Finding the Perfect Shampoo! Shampoo is something that everyone owns, we use it every other day and there are thousands of different kinds your can buy. So this post is all about shampoo and conditioner. I am going to go over what shampoos are my favorites, why, and what they should be used for. 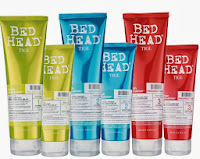 I will go over healing shampoos, color shampoos, sulfate-free shampoos and more! This is a line of three shampoos and conditioners that are rated for every day use. Re-Energize (green bottle) is for average and overall healthy hair. Recovery (blue bottle) adds hydration to dull and dried out locks. This shampoo is perfect for hair that has been lightened or bleached several times! Resurrection (red bottle) adds mega nutrient and protein shocks to the hair. I personally love this line, and I use the Recovery because I have really dry hair. The whole line smells amazing, and you can pick it up at your local salon, or online! The best sulfate free shampoo, hands down is redkens. If you want to know what the difference between sulfate free shampoo, and regular shampoo is you can check out this blog post explaining it all. I don't want to explain it all, but I will say that sulfate free shampoo basically doesn't lather like regular shampoos, but also doesn't strip as many of your natural oils and conditioners either. You do not need conditioner when using sulfate free shampoo. I personally don't love sulfate free shampoo, but some people do, and they "have to have it". 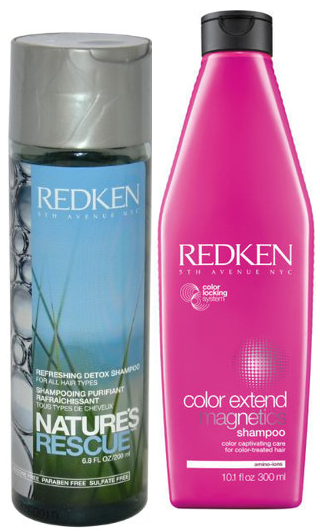 So if you fall in that category (or if you just want to try it out) I recommend either Redken Natures Rescue or Redken Color Extend Magnetics. Obviously the Redken Color Extend Magnetics is for people with color treated hair, and the Natures Rescue is for everyday use for any hair type. I have yet to find a shampoo for color treated hair that works as wonderfully as Redken Color Extend. This is not a sulfate free shampoo, like the one mentioned above. Don't get them mixed up. For sulfate free you need a pink bottle, this one is in a red bottle. This is an award winning product, that protects your hair from UVA and UVB rays which helps your hair not fade. It maximizes color vibrancy and strengthens your hair. For people with curly hair that want to help maintain firm and bouncy curls, this is the shampoo for you! 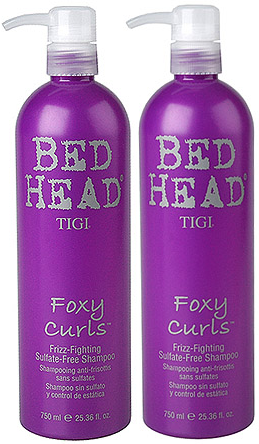 TIGI BedHead Foxy Curls shampoo and conditioner has everything you need. It focuses on improving the hair's natural elasticity so that your hair can have fun with its natural curls, or to help spruce up and extend the life of your perm. My mother has a perm, and she is addicted to this shampoo! Her perms lasted an extra 2-3 months when she started using this product. American Crew is the place to go to get anything hair for men. Styling products, and shampoos re created to smell manly (but not overwhelming) and to be simple to use and give you exactly what you need. On the right you see the Daily Conditioning Shampoo by American Crew, but they also have 3-in-1 Conditioner, Shampoo and Body Wash, Anti-Dandruff Shampoo, Moisturizing Shampoo, Hair Thickening Shampoo, and more! All of their products are great and easy to learn more about at their website right here! Dry Shampoo is used like an aerosol hairspray on the roots of the hair. It absorbs moisture and grease while eliminating shine so that your hair looks dry and clean, on the days in between shampoos. My favorite dry shampoo is TIGI Rockaholic Dirty Secret Dry Shampoo. The smell is pleasant, but not overwhelming, it has a matte finish, and it applies evenly. I own it, and I use it every other day, and I love it! Dry Shampoos that you buy at the drugstore or Walmart, simply can not compare.